Graduates will be suitable for employment in outward-looking New Zealand SMEs looking to establish contacts or a presence overseas through the transfer, import or export of goods or services. To take an interdisciplinary approach to study in the fields of international business studies and innovation studies within a single qualification, while retaining the core business disciplines of economics, with an emphasis on digital marketing, communication technologies, strategy and ethics. To move beyond traditional entrepreneurship or new venture approaches to innovation and examine innovative techniques and concepts within the international corporate environment. The innovation component of the course in particular requires an ability to think beyond the status quo, to strategically develop, critically evaluate and implement new ideas. Students will take the eight papers over three trimesters of 16 weeks with a one-week break between each trimester and a two-week break at Christmas. Initially it will be taught in the evenings, from 5 to 9 pm on three evenings per week. 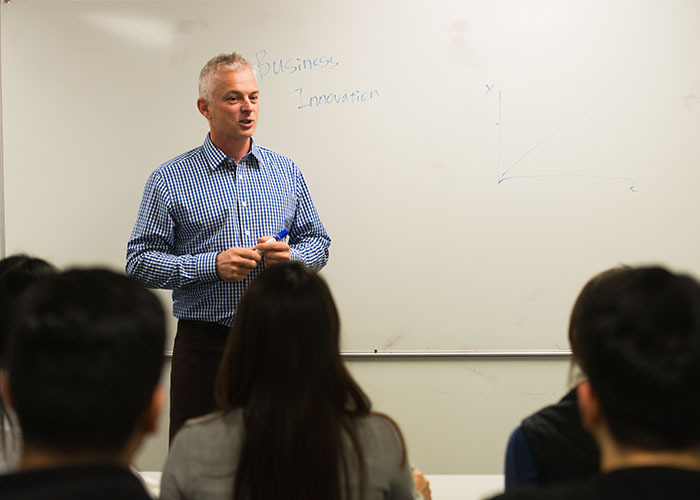 Guest lectures are a regular feature of the programme. Graduates of this programme with its three pathways will have an advanced level of international business and skills. These attributes equip graduates for a wide variety of business roles in an international environment. These attributes equip graduates for a wide variety of business roles in an international environment. They are ready to pursue a career in the global economy with awareness of international trade concepts, cultural issues, ethics and the internationalisation of innovation. Graduates will find opportunities in roles across business innovation such as Strategic Planning Manager, Business Development Manager, Key Account Manager and Infrastructure Advisory Consultant. IELTS with a minimum score of 6.0 overall in the Academic module, or Test of English as a Foreign Language (TOEFL), 550 for the paper-based test and 220 for the computer-based test, or The New Zealand Certificate in English Language Level 4 with the Academic Endorsement or any equivalent recognized by NZQA.